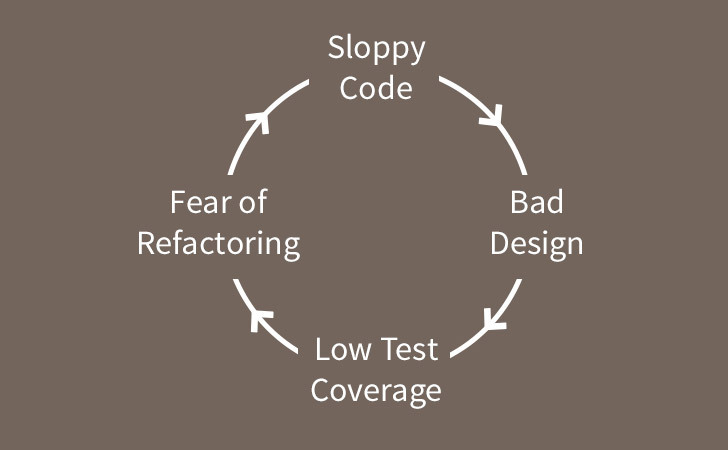 We often have to work on code that doesn’t have good test coverage. This creates a number of problems. The first problem is that if you don’t have good test coverage, it’s hard to know whether your code changes will break other parts of the application, so you need to have a strategy for handling regressions. The second problem is even more troublesome. Generally, code that doesn’t have good test coverage is also badly designed. One of the big benefits of test driving your code is that it moves you towards a range of good practices. Most of the time, when you test drive code you’ll write your code “outside in” - focusing on the interface that the test needs to validate before thinking about the implementation you’ll need to deliver. It also makes it more likely that you’ll create classes with a narrow responsibilities that are loosely coupled, as the excessive setup required for testing tightly coupled code will quickly move you towards reducing your coupling. So if you’re working with code that doesn’t have good test coverage, most of the time it will be harder to write tests for and more tightly coupled than test driven code. Finally, because of the the first two issues, the chances are that when changes have been made to the project in the past, developers will have made the smallest possible changes consistent with getting their new feature working rather than refactoring and cleaning up the code every time they touched it. Because of this it’s likely to have a high degree of technical debt, making it even harder to work with. When confronted with code that doesn’t have good test coverage, it’s important not to try to “boil the ocean” with unit tests. It never makes sense to take a couple of weeks (or months) to try to get the code coverage up across the entire app. So, what is the answer? When you need to work with a big ball of mud, where should you start? A good starting point is to take some time with the product owner/business analyst/business stakeholder to really clarify the key user journeys. Ask, “what are the most important things that your key audiences need to be able to do through the app?” Then create a handful of concrete scenarios for each user journey and write automated acceptance tests for them. For a web app you’d probably use a tool like Cucumber, RSpec and Capybara or Selenium to create these “smoke tests”. They don’t guarantee that your app is working correctly, but they should catch most of the large, systematic problems. Next, test drive all of new code. That way you have confidence in the new functionality that you are adding to the system. If necessary, you might need to write a thin anti-corruption layer to provide a clean interface to code against for integration level testing. Finally, whenever you find a bug, start by writing a failing test at an appropriate level (ideally a unit test). Then confirm that once the bug is fixed, the test passes. If you’re working with a team that is not used to test driving code, take the time to make sure that they’re able to run the test suite locally and pair with them to get them used to test driving new functionality. Also make sure to set up continuous integration to your version control system so you’ll quickly get notified if any of the tests break. Working with legacy code with limited test coverage is hard, but by following the ideas above it should be easier to get to grips with the code base. And over time, you’ll notice that the test coverage in the areas you care about - where you make most of your changes - will start to become reasonable. Usually within 6-12 months you end up with pretty good coverage in the parts of the app that really matter.